As for many in my generation, Facebook is a guilty pleasure during the day. When I have downtime I check my Facebook page to see how friends’ kids are growing, who is asking for prayers for their families and whether George Takei has anything wonderfully humorous to contribute to the day. 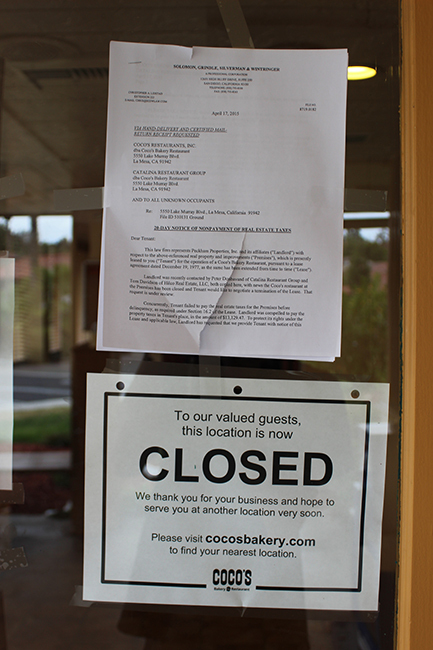 The other day, as I was browsing my newsfeed, I was unpleasantly surprised to see a friend’s post that Coco’s Bakery Restaurants were closing all over San Diego County with only a select few to remain open. “No way,” I thought, frantically searching any news on Coco’s. “They’re not going to close my favorite spot on Lake Murray Drive. 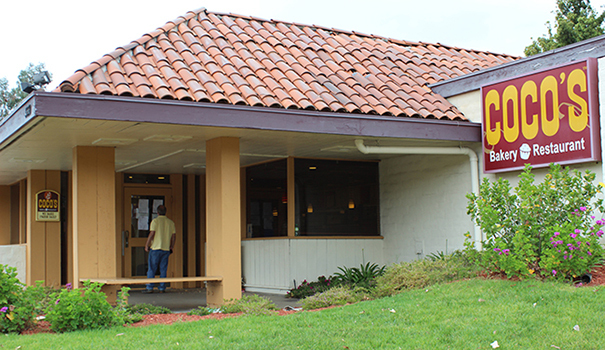 It serves too many purposes in our community.” In addition to being our regular after-church Sunday breakfast spot, Coco’s was often the place local organizations held their meetings. After looking for several minutes I found one article that stated a few Coco’s would be keeping their doors open. Alas, La Mesa’s Coco’s wasn’t one of them. It felt as though a dear friend had passed away without a warning. Coco’s meant a lot to me and my family. It was the first restaurant to host our then-infant daughter. While other restaurants have guests who frown at children being children at the table, the people who frequented Coco’s were warm and family oriented. Anyone who knows about Lake Murray Coco’s knows at least 70 percent of its customer base was at least 70 years old. And those grandparent-types were the ones who would smile as we walked in with Quinn, happy to see a family join them in the next booth. “We have to find a new place for Sunday breakfast,” said my mom sadly. My mom, who turned 81 in February, really liked Coco’s. It didn’t cater to the more modern gourmet palate and instead offered simple diner options she recognized. Walking into the restaurant, she would always walk up to the pies on display to see if there was one for which she had a special hankering; most often she chose a straightforward lemon meringue. I told her we had a few other options around town and that we’d find one she liked just as much. She nodded, but I can tell that at her age, it’s hard to have to shift to a completely different venue, even if it’s only a few more minutes away. I also knew several Coco’s staff members by name, including Jessica, one of my favorite servers of all time. Her brother, Ricky, also worked there, as did her mom. Unless by lucky happenstance, I will probably never see any of their smiles again, a hard reality for me as they had become people in my neighborhood. As bad as I felt, I can’t imagine what it was like for our Coco’s staff. 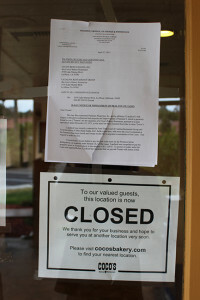 I recently read in Nation’s Restaurant News that a former 24-year employee of the Coco’s Bakery and Carrows restaurants filed a federal lawsuit April 8 charging new owner Food Management Partners Inc. with failing to give fair notice for mass layoffs. It makes sense as many of the thousands of employees terminated were suddenly given what would be their last paychecks in a staff meeting April 3. So while it would have been nice for Coco’s to have given its loyal customers a week or two to say our proper farewells, it would have been even nicer for its owners to reward its longtime employees for their service by giving them more than a few days’ heads-up. —Genevieve A. Suzuki is a La Mesa resident, former La Mesa Courier editor and a practicing family law attorney. Get in touch with her through her website, SDLawyerSuzuki.com. We arrived from Canada this week to be told as we drove to our daughter’s home than Cocos on Lake Murray Blvd. was closed. Always a great breakfast place and my family enjoyed the pies. Son-in-law couldn’t believe when arriving home from work finding a cream pie in the fridge. Knowing we didn’t have a car or bike to use that I had walked the 3 mile return trip to get his favourite pie. Cocos and staff will be missed. Good luck to the staff who have lost their jobs. May you get a job working somewhere that has owners how care about them and their families. Don’t know about California labour laws but corporations when closing their business owe it to the employees to give sufficient notice or severance pay.